The Blot Says...: Funko’s NYCC 2016 Exclusives Wave 5 – Star Wars, Rogue One, Indiana Jones & More! 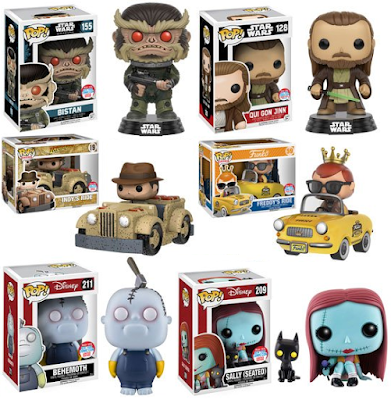 Funko’s NYCC 2016 Exclusives Wave 5 – Star Wars, Rogue One, Indiana Jones & More! Funko has announced its fifth and final wave of New York Comic Con exclusives, and this announcement is primarily Disney themed with some huge properties like Star Wars, Indiana Jones, The Nightmare Before Christmas and Pirates of the Caribbean. What do you think!?! Funko’s fifth wave of exclusives includes NY Taxi Freddy Pop! Rides, Pirates of the Caribbean Barbossa Pop! Disney with Monkey, Nightmare Before Christmas Seated Sally Pop! Disney with Cat, Nightmare Before Christmas Behemoth Pop! Disney, Rogue One Bistan Pop! Star Wars, The Phantom Menace Qui Gon Jinn Pop! Star Wars, Indiana Jones Adventure Pop! Rides.